← The origin of that globe? 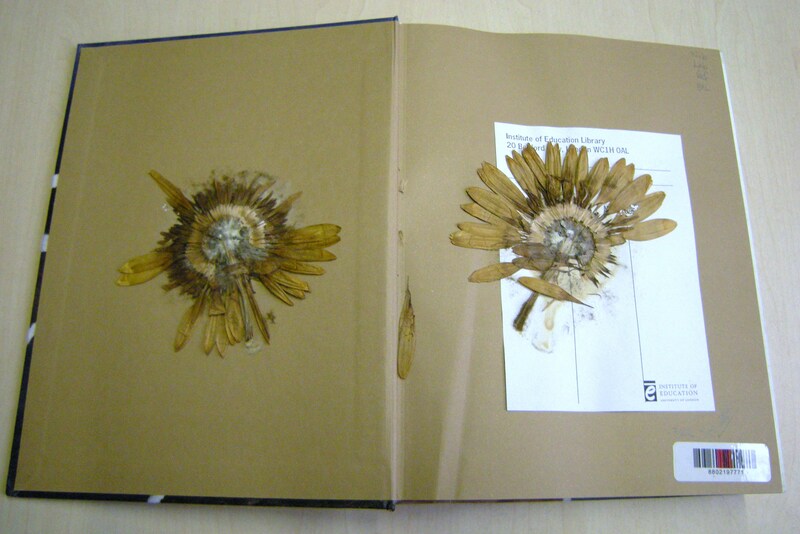 We have a new display in the library to highlight some of the damage that occurs to our books. Obviously, with books passing through so many hands a little light wear-and-tear is to be expected, but from time to time books are deliberately misused and defaced. We hope that by making people aware of the state that some of our books are returned to us in they may in future think twice before damaging them. Remember, our books are expensive to replace and many of them are irreplaceable or no longer in print. 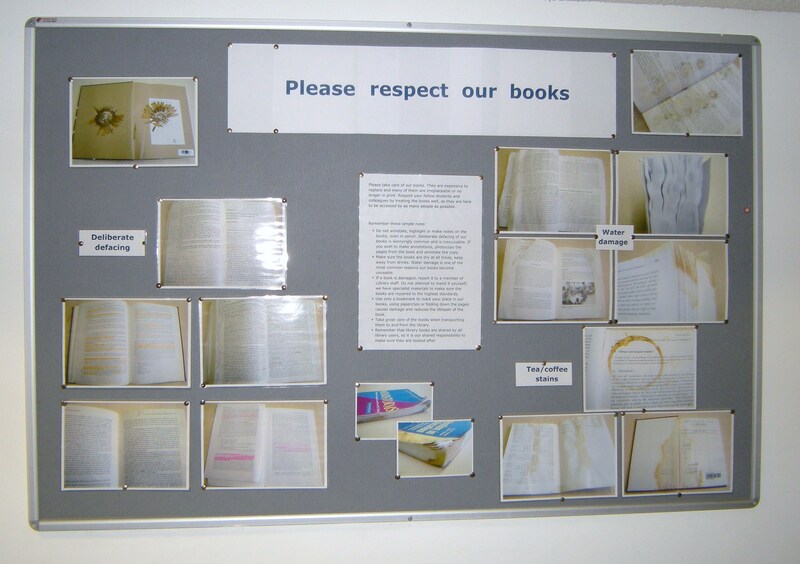 Respect your fellow students and colleagues by treating the books with care, as they are here to be accessed by as many people as possible. Do not annotate, highlight or make notes on the books, even in pencil. Deliberate defacing of our books is worryingly common and is inexcusable. 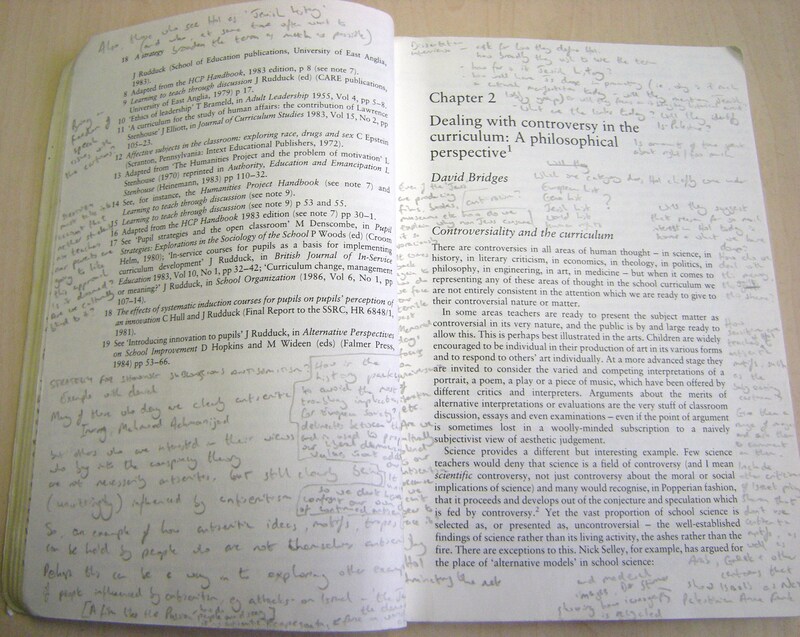 If you wish to make annotations, photocopy the pages from the book and annotate the copy. Make sure the books are dry at all times, keep away from drinks. 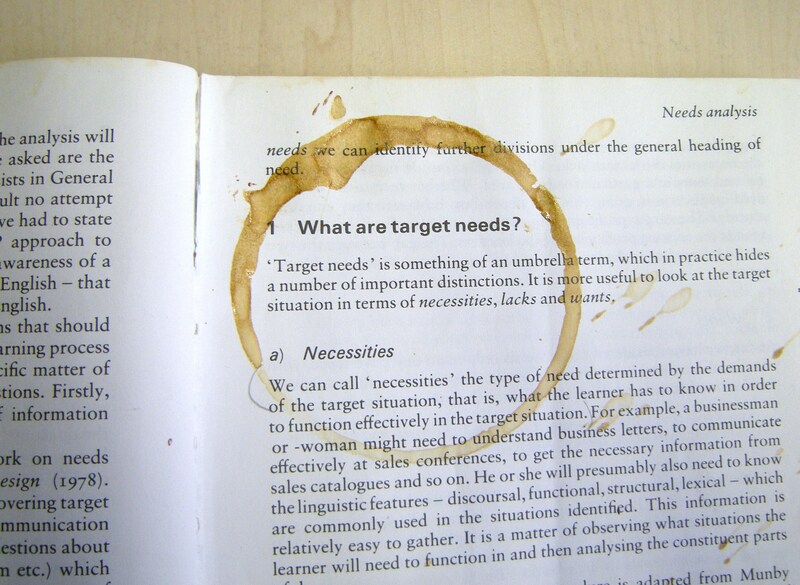 Water damage is one of the most common reasons our books become unusable. If a book is damaged, report it to a member of Library staff. Do not attempt to mend it yourself, we have specialist materials to make sure the books are repaired to the highest standards. Use only a bookmark to mark your place in our books, using paperclips or folding down the pages causes damage and reduces the lifespan of the book. Take great care of the books when transporting them to and from the library. Remember that library books are shared by all library users, so it is our shared responsibility to make sure they are looked after. We hope that you find the time to take a look at the display on your next visit to the Library. This entry was posted in Library and Archives and tagged displays. Bookmark the permalink. Sean rightly points out the unneccessary damage done to books, but related carelessness also effects DVDs in our collections. Although the library buys a number of manufactured commercial DVDs, we also have a large stock of recorded discs, both our own Off-Air recordings and from smaller publishers who use DVD+R/-R recordable discs. These DVDs are much more vulnerable to damage from handling and being scratched by contact with surfaces. Since some of the DVDs from specialist educational publishers cost anything up to £100, a moment’s thoughtlessness can be expensive, and annoying for later users when picture and sound break-up or discs skip or freeze.